crispingcanary.blogspot.com - Images of peak summer with everything burning and evaporating..One day after school..Special because of an honor sash? Or because of finding somebody who was always there? pradipwritenow.blogspot.com - This is about the mischievous acts of self and other friends during College days. blog.iamsarav.com - my life.. her shadow.. she taught me what life is with her experience.. thanks! girlcookart.blogspot.in - One of those precious memories that I share with Ma that would otherwise get lost in the traffic of daily routines..
Today's parents want their kids to grow up close to nature so they would have real, authentic and natural experiences. When you grew up, or raised your kids, did you have an experience which felt 100% real to you? Maybe the walks in the park with your Dad when you were 5 years old, your Grandmother's stories, your son's first words, or you and your childhood friend "borrowing" mangoes from a neighbour's tree! 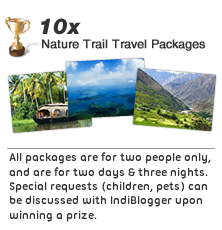 Blog about it and win exciting nature travel packages for you and a friend!